This stunning retro server/bar/sideboard is a rarely seen piece from the upscale Broyhill Premier Emphasis line. This stunning retro server/bar/sideboard is a rarely seen piece from the upscale Broyhill Premier Emphasis line. 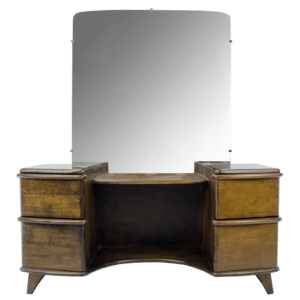 Built by American craftsman during the 1960’s, this Mid Century Modern Broyhill Premiere Emphasis Server is made from walnut veneer with a gorgeous burnished finish to the wood. The fronts of the doors feature an abstract rectangular/oval pattern, the signature design detail of the ‘Emphasis’ series. The slade-colored Formica top features a drop leaf on either side. The walnut case contains two drawers over four cabinet doors. Note the left drawer, divided and lined with rich blue felt, while the right drawer holds a lined flatware tray. Unlike many Mid-Century pieces, the finished back of the server allows it to be free standing. The Broyhill Premier tag appears in the right drawer. In addition, it also features a small original tag for the Formica top “Reliance PANELYTE” stapled inside the right drawer. From the Broyhill Catalog: “Emphasis by Broyhill Premier: From Ancient Egypt Comes The Art of Veneer Craftsmanship. In the days of the Pharaohs, veneered furniture was a luxury available only to royalty and the very rich. Skilled Egyptian cabinetmakers originated the art in order to match wood grains and create beautiful patterns. Today, modern electronics and manufacturing facilities make veneered construction available to everyone with expert craftsmanship, veneer strengthens and preserves fine furniture. This outstanding group brings you superb graining and bonded strength, through the ancient art of veneering. This piece boasts an impeccable vintage style that assures you will have a fashionable and functional piece to last for years to come. Item measures approximately 29 ½” Tall x 48” Long x 16” Deep. With booth leaves open, the item measures approximately 70″ Long. Pre-owned, the item is in Very Good condition with wear commensurate with age. There are minor scuffs and light scratches on the Formica top. Some visible wear on handles and top of right drawer from use. Wear near left door latch. Finally, please review all photos carefully as they are an essential part of our description.